ASIA ARTIST AWARDS 2016: WINNERS! Home Concert / Events ASIA ARTIST AWARDS 2016: WINNERS! 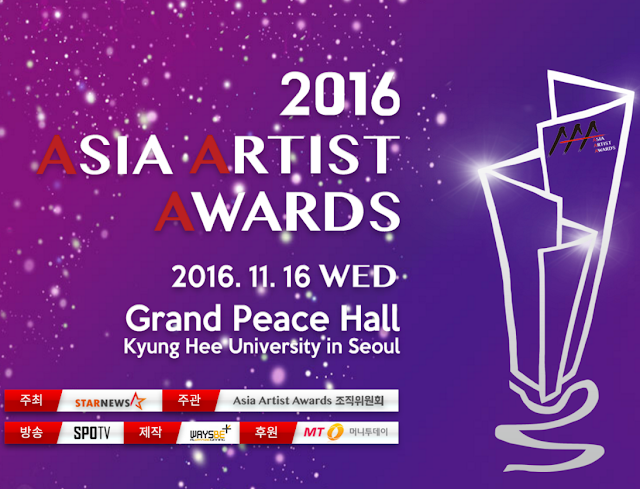 On 16th of November, the “Asia Artist Awards 2016” was held at Kyung Hee University in Seoul. AOA, B.A.P, BLACKPINK, Block B, BTS, Cosmic Girls, Dynamic Duo, EXO, Gummy, Han Dong Geun, Hwang Chi Yeol, Lee Jung Shin, MAMAMOO, NCT 127, SEVENTEEN, TWICE, and VIXX attended the ceremony. Also, actors Ryu Jun Yeol, Park Shin Hye, Park Bo Gum, Suzy, YoonA, Kim Yoo Jung, Park Hae Jin, Kwak Si Yang, Park Hye Soo, Shin Hyun Soo, Nana, Namgoong Min, Jin Goo, Kim Ji Won, Jo Jin Woong, Seo Kang Joon, Nam Ji Hyun, Nana, Chi Pu (Vietnamese actress), and Sung Hoon attended the event as well. Leeteuk, Lee Si Young, and Jo Woo Jung were the MCs for the event. Here are the list of winners who took home big at the award ceremony. Previous articleCheck out your favorite stars at Asia Artist Awards Red Carpet!